This week my mind is on octopuses. 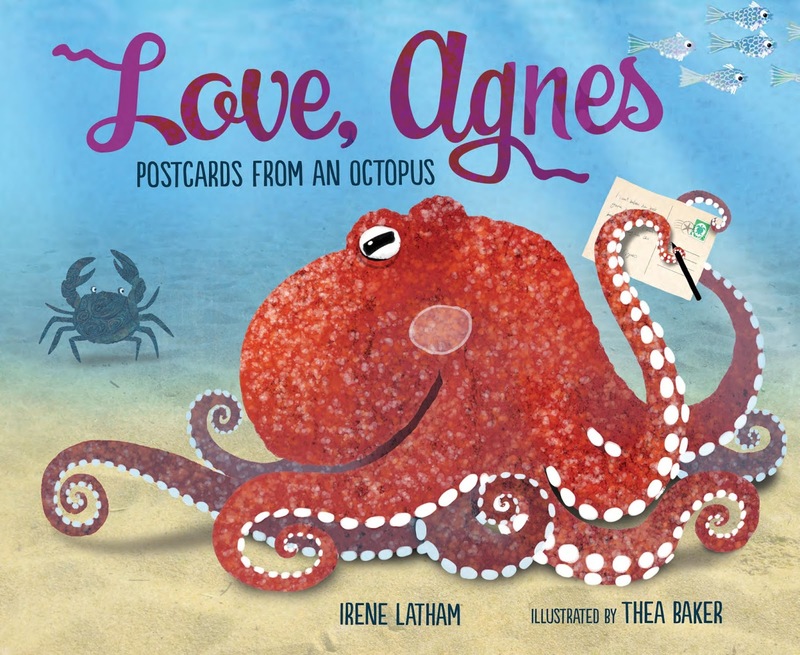 One octopus in particular: a giant Pacific octopus named Agnes... who writes (and receives) postcards. That's because Agnes' story will be released from Millbrook Press/Lerner October 1. Lovely illustrations by Thea Baker. To celebrate, I'm christening October "Octopus Month," and I need your help! 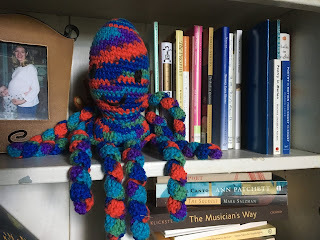 I would love to feature some octopus poems and art here on this blog throughout the month. a cuddly octopus perched in my studio! So... do you have an octopus poem or art piece? Or, would you like to write one? I do hope you'll say YES! You can send it to my email: irene (at) irenelatham (dot) com. 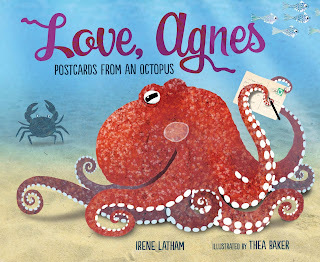 In fact, LOVE, AGNES started out as an octopus poem titled "Postcards from an Octopus." Greg Pincus posted it on his GottaBook blog back in April 2013. Since then I've written quite a few octopus poems -- for a time, LOVE, AGNES was a collection of poems! Here's the poem that began the collection... and when you read LOVE, AGNES, you'll still see these same themes, and even some of these very same words - just presented in a completely different way!